A normal transition would just go from slide 2 to 3, abruptly changing the position of the trapezoid. But by applying the Morph transition, the trapezoid smoothly glides from the upper left corner to the lower right corner, just as if it were an animated GIF file or something similar. This works really well if you have a series of points that you want to call out on the left side of the screen, but then move them to smaller text on the right side of the screen as each new point comes up. 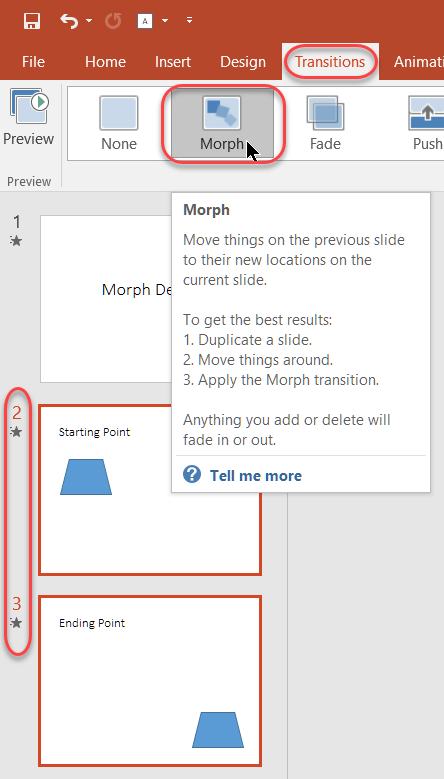 The morphing will allow them to move over to the right on the screen, and add that little extra pizzazz to your presentation. Please note… Transitions are one of those things where a little goes a long way. If you have things flying all over the screen, it will quickly become distracting to the audience. While morphing and other transitions can be effective in highlighting certain content, use them sparingly.